Round 1 ended with this Cause Not Found report from my whole exome study done by GeneDX. This is the report. The TNXB gene provides instructions for making a protein called tenascin-X. This protein plays an important role in organizing and maintaining the structure of tissues that support the body's muscles, joints, organs, and skin (connective tissues). In particular, studies suggest that it helps to regulate the production and assembly of certain types of collagen. Collagens are a family of proteins that strengthen and support connective tissues throughout the body. Tenascin-X is also involved in regulating the structure and stability of elastic fibers, which provide flexibility and stretchiness (elasticity) to connective tissues. When TNXB causes EDS, often it is because the gene is missing entirely. Detecting a missing gene is a nightmare. A whole exome generally will not catch missing genes. It just extracts the codes of what is there. Doubly hard to examine. The monster supercomputer would have to dig deep in a difficult area to look for something that is not there. My report also states the cause of my genetic disorder could be in the intron area, also called the junk DNA. Not junk at all, this area seems to regulate gene expression. No DNA sequencing was available for the intron area back then, except in a research lab. I looked around, as always. No lab in the United States was offering a commercial examination of TNXB. Labs in Europe were. I talked to DNA labs in Spain, Germany and the UK. They told me they were finding a Tenascin X problem to be a rare cause of EDS, and did I want mine studied? Yes, but I did not have an extra $7,000 to pay a lab in Europe to look at mine. I had to wait. I cried some more. I got very busy, cutting down on my opiates and finally getting off completely, which was a whole other source of lots of crying. Up at night during opiate withdrawal, every now and then I would do a Google for a lab offering a TNXB study. One magical day, I found that Prevention Genetics was offering it on their menu of tests. I called UCLA to schedule a genetics appointment just to see what was up there. It took six months to get an appointment. Genetics appointments are hard to get. The day of my appointment was an exciting day. I was fresh off long-term opiates and a wreck but what an accomplishment. So proud of myself I was. I was looking forward to new relationship. The doctor examined me (yes, I sure do bend backwards) listened to my C injection story, asked what I had done for physical rehab (vibration training of course, what better way to strengthen collagen! plus weights). He empathized with the agony of opiate withdrawal, and then he sent me down to the UCLA lab for a blood draw to send to Wisconsin, where Prevention Genetics is. Round 2 had officially begun. And so has Round 3. 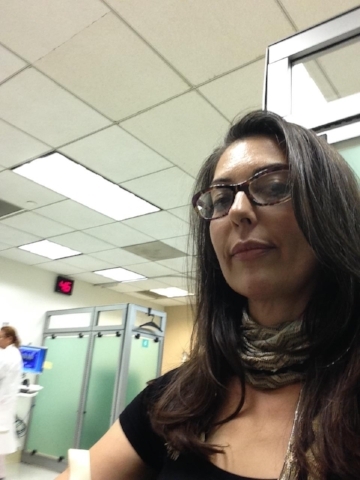 UCLA lab for blood draw for TNXB exam. Oh yeah. The geneticist had the UCLA lab put my blood in the freezer. It did not go to Wisconsin that day, not for a long time. Why? I get kicked around plenty as a patient, but I am often surprised how much doctors will go out of their way for me. I don’t know why they do. I think they get how hard am I trying. I come to appointments well-dressed (which was not possible before my daily C shots) and I try to sound like an informed patient. I do not waste their time them spouting quackery or with any of my emotional distress over my life-ruining disease. I have no time for any of that nonsense either. The doctor said wanted to see my whole exome study. Really?? Since it was done commercially, I own it. I have every right to it. If you give your DNA to a research project or the NIH, chances are you do not own it and cannot get it. I filled out a release form, and GeneDX bleeped the .vcf file of my DNA across the country from Maryland to UCLA. UCLA had someone go through it as research project, to see if there was possibly a cause of my EDS lurking about in there, or maybe an explanation for why injected C was so helpful when oral C was not. One day, UCLA called me in for a blood draw. W-O-W. This meant they found something! Before a report could be issued, the UCLA lab had to check the coding on the suspicious gene themselves. They could not rely on the decoding GeneDX had done. Quality assurance! I was super excited. Does this mean cause found? I may burst from excitement. DNA Study: UCLA analysis of the raw data from my GeneDX Whole Exome Sequencing. Waiting for the Chief of Medical Genetics and Genetics Fellow, I was super excited. What would they tell me? Was I going to get a CAUSE FOUND??? Being festive in the Children’s Hospital. UCLA gave me a report of "Variant of Unknown Clinical Significance" which means they found something of interest but hard to say if it is causing anything. Both my versions of SCN10A had never been seen before. Harmful copies of this gene have been known to cause pain. Interesting. In cases like this, when a version of a gene has never been seen before, geneticists run the code through gene prediction software. The software estimates if this is possibly a dangerous gene. The gene prediction software programs concluded my SCN10A’s were likely benign. The geneticist told me he did not think my strange versions of SCN10A were causing my EDS. He told me he had to agree with GeneDX: CAUSE NOT FOUND. Then he told me that it still is possible that the cause is in there, in a gene that no one yet knows is part of collagen production. Probably not causing my EDS. Probably benign. We are gaining certainty on where my problem isn’t. Then The Chief of Medical Genetics UCLA got on the phone with Cigna, and told them they needed to pay for a Tenasic X Study, because I was cause not found. My blood left the freezer at UCLA for Wisconsin, 7 months after it was drawn.